Established in 1970 in Farmington Hills, MI, Ayers Water Systems, Inc. was formerly known as Smith Well Drilling. Orville Smith, the owner at the time, provided well drilling and pump services to southern Oakland County. Tad Ayers joined the team in 1985 and the company’s services expanded to include water softening, iron filtration, and drinking water systems. Tad Ayers purchased Smith Welling Drilling in 1998 and in 2005 the name was officially changed to Ayers Water Systems. 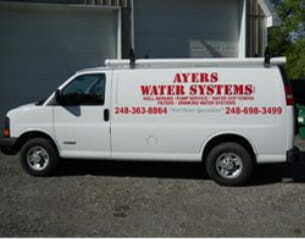 The team at Ayers Water Systems, Inc. has been providing a complete range of well repair services for Michigan families and businesses since 1970. Our decades of experience make us a trusted choice for ‘everything well’ in Oakland County and the surrounding areas. Call us at (248) 891-0378 to schedule an appointment and we’ll have your water restored in no time!